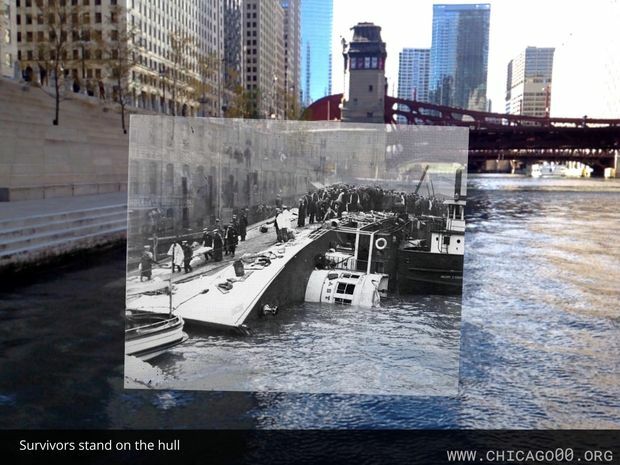 CHICAGO RIVER — A new app lets Chicagoans see the Eastland Disaster unfold right where it happened more than 100 years ago. 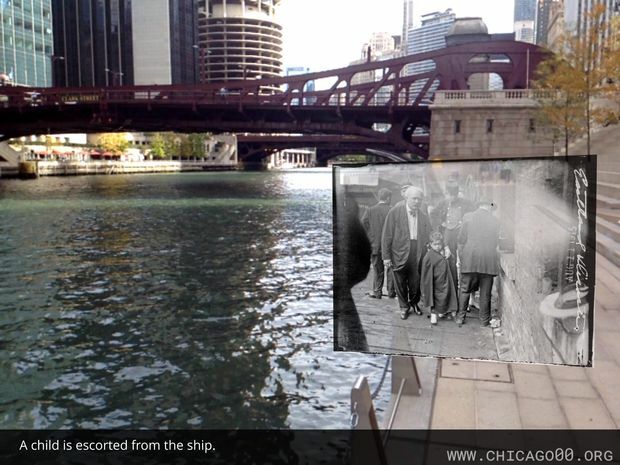 Chicago00, a new app from the Chicago History Museum, uses augmented reality to overlay historic photos of the tragedy over the Chicago River. Listen to Dave Matthews describe using the new Chicago00 app. "We wanted to do something viscerally powerful in terms of bringing history into our world," said John Russick, vice president for interpretation and education at the museum. "We wanted a good story with good images." More than 800 people died when the S.S. Eastland capsized in 1915 between Clark and LaSalle streets on the Chicago River. That's more than double the number of people who perished during the Great Chicago Fire, and the disaster remains the single deadliest event in the city's history. Russick said the museum wasn't attracted "to a disaster story," but chose the Eastland for the app's pilot because it's a compelling story that's also "geographically manageable." Those who use the app can take the whole scene in along a short stretch of the Chicago Riverwalk. "For it to work you have to be where the photographers were," he said. The free app is available for iPhone and Android systems. The museum plans to overlay more historic events, with candidates including the 1893 and 1933 world's fairs in Chicago, as well as a feature on the city's architecture. Russick led a guided tour with the app Friday on the Riverwalk. Cynthia England of River North was among those impressed. "I'm into history and love human stories, human drama," she said. "It's a perfect fit." Susan Vanderkoon of suburban Palatine said one of her ancestors was a firefighter who assisted with the Eastland recovery. She also enjoyed the tour. "I love the interactivity of it," she said. "You feel you're kind of a part of history."